I was 11 years old when I realized that Christmas is no longer about Christ. I distinctly remember a conversation that I had on a bus ride home from school that changed my life forever. The cute little friend that I was talking to (she was a Jehovah’s Witness) excitedly told me “We’re trying out Christmas this year, my Dad is getting me a bike”…BAM, my little eleven year old self was completely shocked and deeply saddened that anyone would think that Christmas was just about getting a gift. What does that tell me about the rest of us Christians though?…We’re the ones that are giving people that impression. This is why I am 100% Anti-Black Friday and we keep the gifts at a minimum (some even second-hand) and really try to focus on the reason that we are celebrating. This is also why my Christmas wreath this year is geared toward the Nativity and not Santa. Don’t get me wrong, Santa is fun, but he is just a side-note at our house (this is also why we don’t go out of our way to visit Santa). 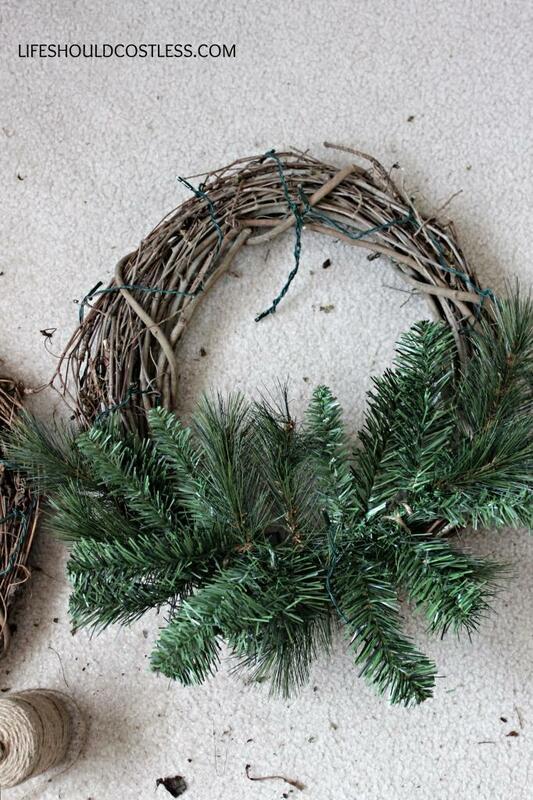 On to the wreaths. My taste is on the shabby side, so I use burlap and twine and all of that kinda Country-ish stuff and then try to class it up a bit. I know that not everyone is going to love them, but I have been putting a TON of thought (thank you Sam, the mastermind behind my color scheme), creativity, and work into them so I hope that you all like them enough to share this post with your friends and family. It could also be a pretty awesome Super Saturday project…just sayin’. 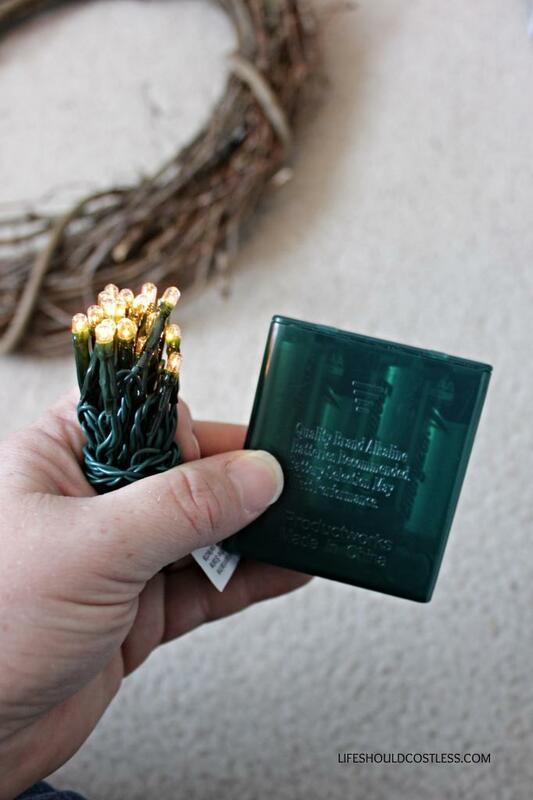 Next, I used some clear rice lights (Hobby Lobby was the cheapest I found these, less than $3 when using a coupon). 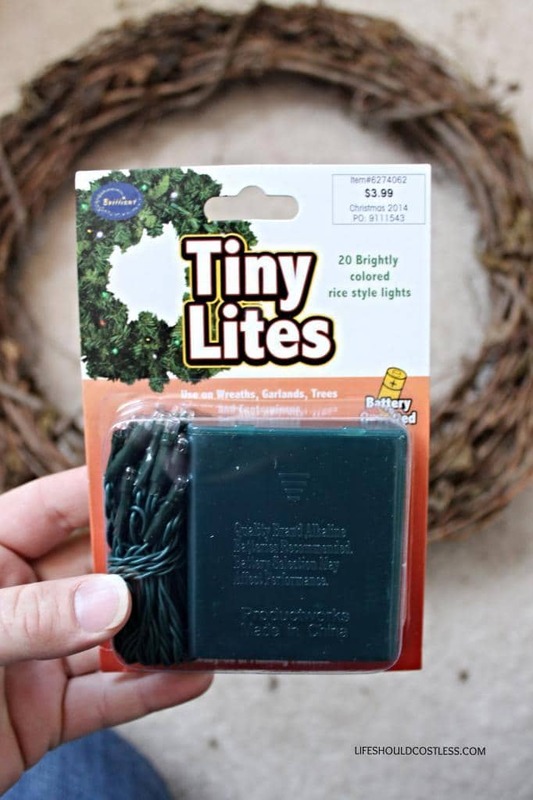 The package didn’t say clear, but you can tell just by looking at the little light bulbs that they are clear. The colored ones look colored. Next, I put in my batteries to test it out. 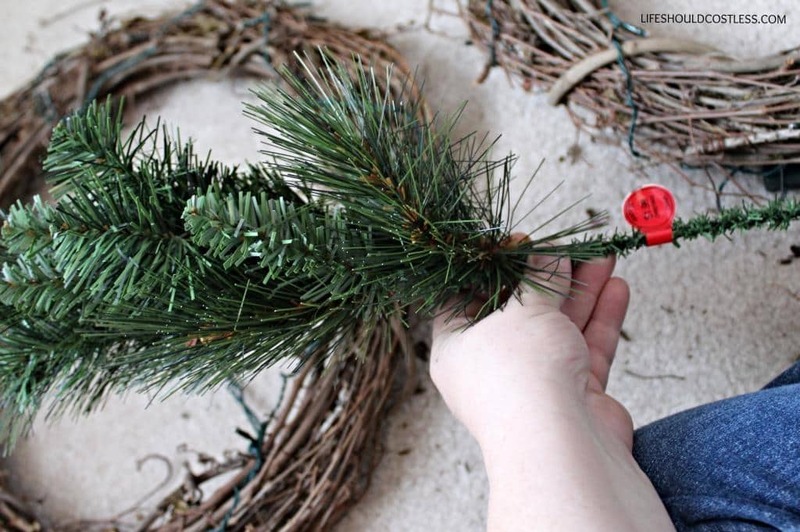 How sad would that be to get to the end of the wreath-making just to find that the string of lights were bad and you’d have to take the whole thing apart? This type of rice light requires 4 AA batteries. When stringing the lights, I let the first single bulb hang down at the top and then I left one with lots of slack at the bottom to allow me to light both the star and Nativity ornaments. I tried to space the lights out at evenly as possible and it turned out ok. I think I ended up flipping them upside down so that the battery pack would be able to be hidden within the greenery. 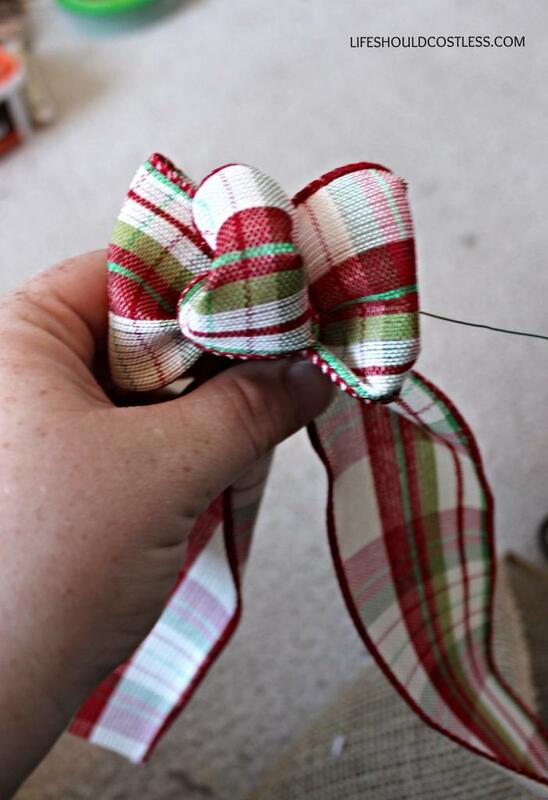 I’m still learning when it comes to crafting…no longer a total beginner, but definitely not an expert…yet! Since someone had walked off with my crafting wire, I had to start out with securing it all to the wreath form with fishing line…dang kids always walking off with my stuff… gotta love ’em. Once the lights were all attached, I got the pine looking portion ready to go. 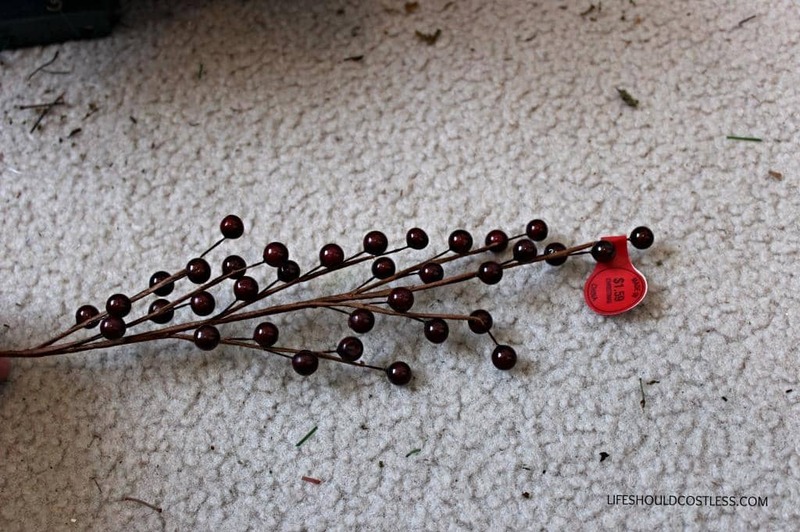 I found that it was way cheaper to get these little sprigs of it from the bins at Hobby Lobby instead of buying some pre-made garland or something similar. 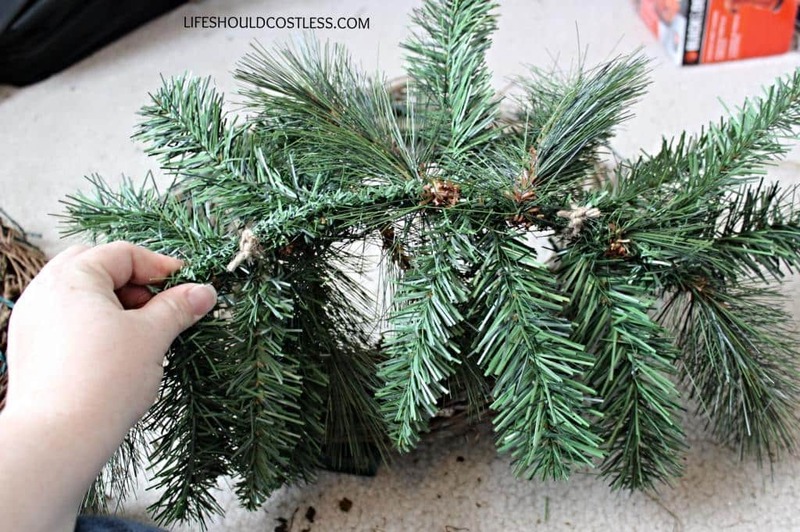 Plus, I really like that this particular one was under $2/a piece and has more than one type of pine needles. 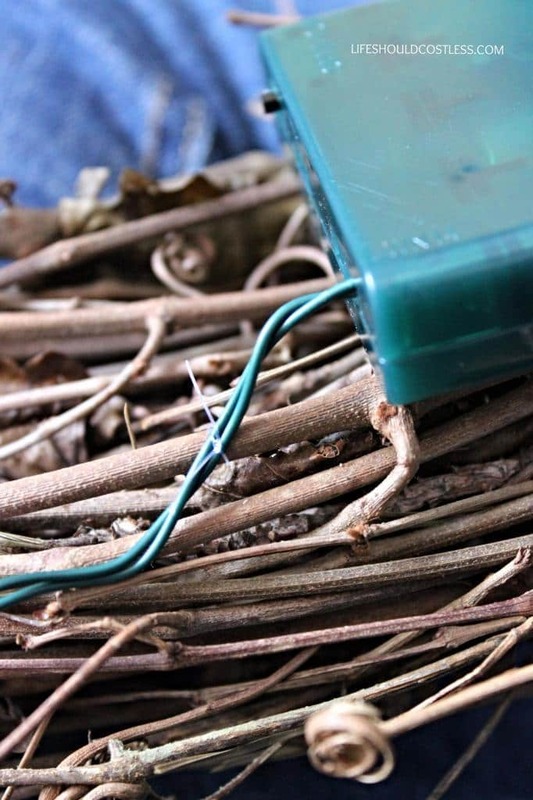 I combined the ends of two sprigs and tied the ends together with some twine…I was still lacking my wire at this point (the twine is a good visual so that you can see where the sprigs ended). 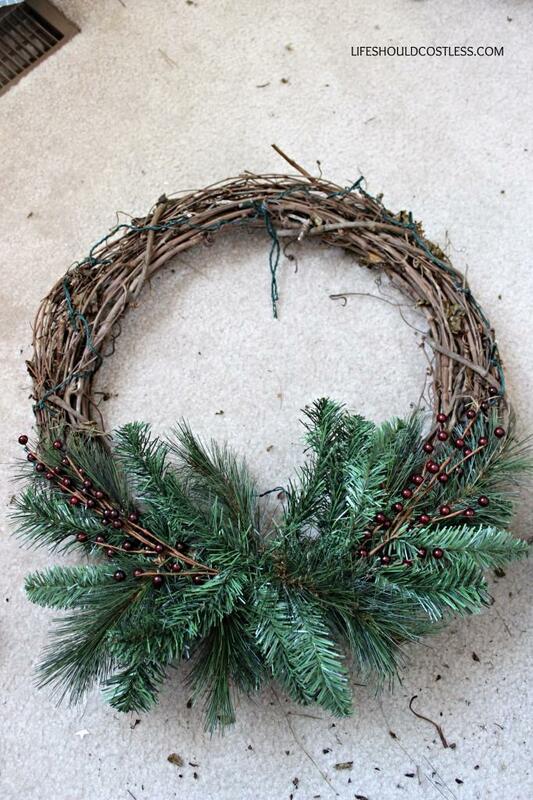 After I combined the ends I bent the wire within the sprigs so that they would match the curve of the wreath. 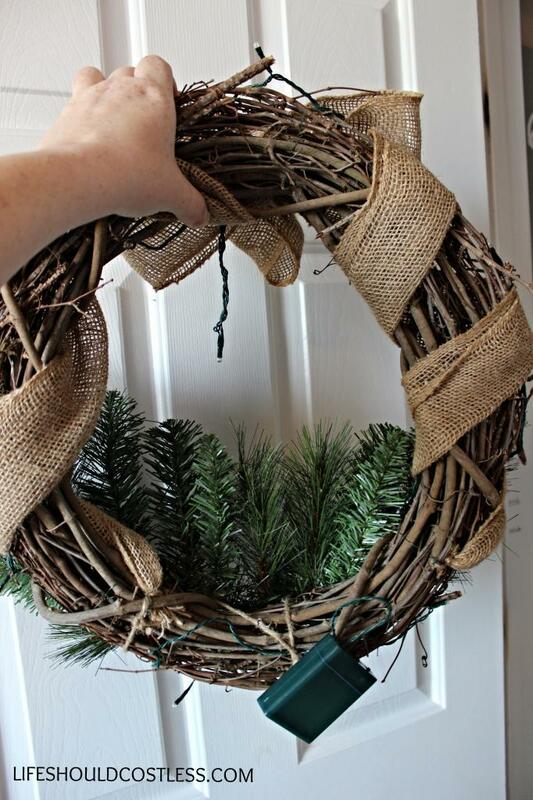 Then I just attached it to the wreath form also with twine. 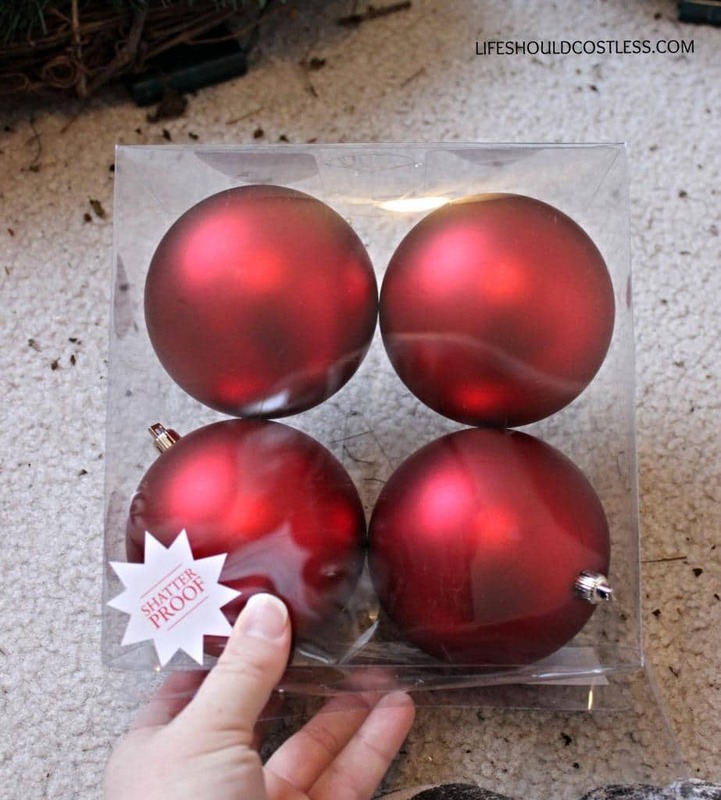 I also found these holly berries at Hobby Lobby in the bins. I really like that they are a darker red rather than a bright red. 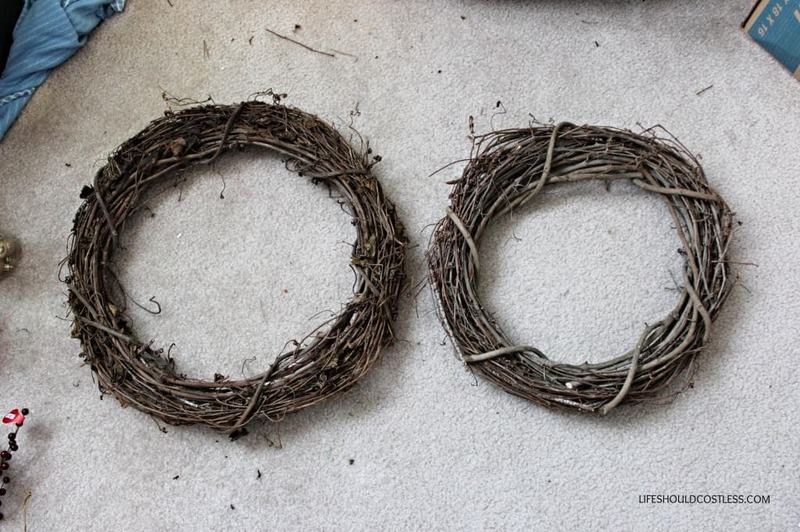 I ended up cutting a little off the ends of these, bending them to match the curve of the wreath, and then attaching with crafting wire…I had to buy more because I still hadn’t found the old one by then. I only got to work on these a few minutes here and there so it took a few days for them to come together. This just shows you how it looks with the berries attached…it’s not perfectly symmetrical of course, but that’s one good thing about shabby decor…it doesn’t matter. 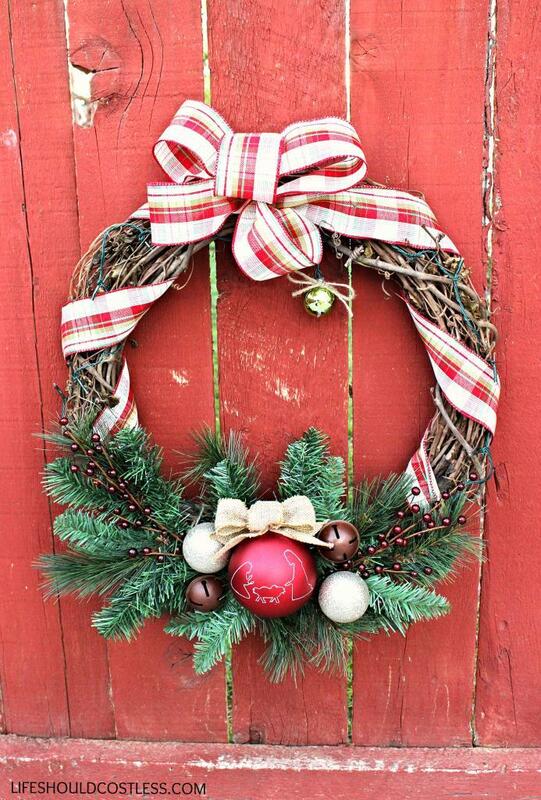 All I had done was play around with the ribbon and crafting wire until I liked the bow that was made and then I left the streamers really long and wrapped them down the edges of the wreath ending at the greenery. I attached the ends with crafting wire as well. Now it was time to add some ornaments. This is the best part of the whole project! 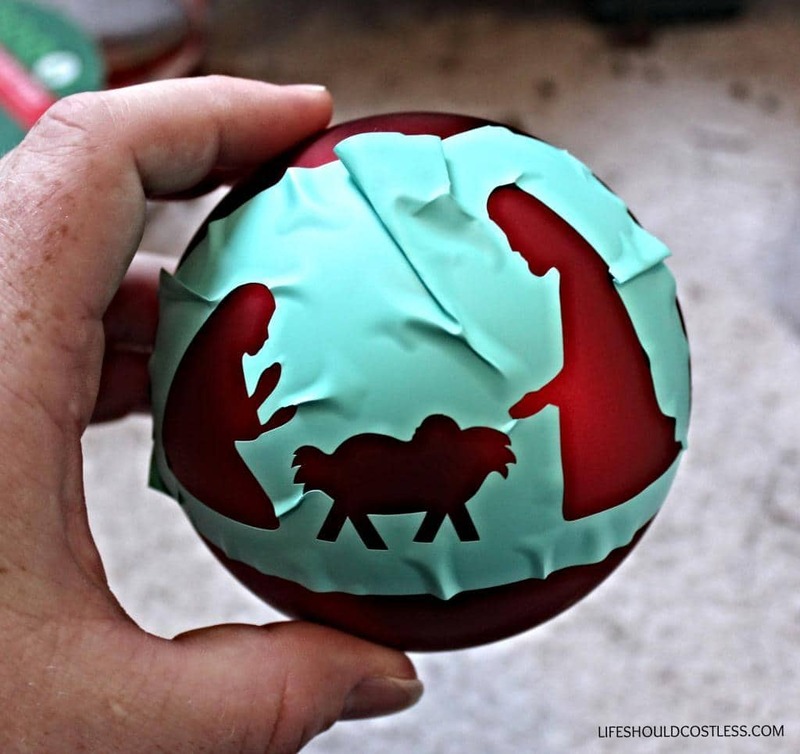 A couple of months ago I came across this really cool idea (she also has a youtube tutorial in that post so watch it if you really want to learn some technique and more info about what does and doesn’t work) to Dremel designs on to shatterproof Christmas ornaments and then you put a rice light inside and the light shines through showing the design that you etched. Oh boy, I was so giddy when I saw that post. It sure got my creative juices flowing. 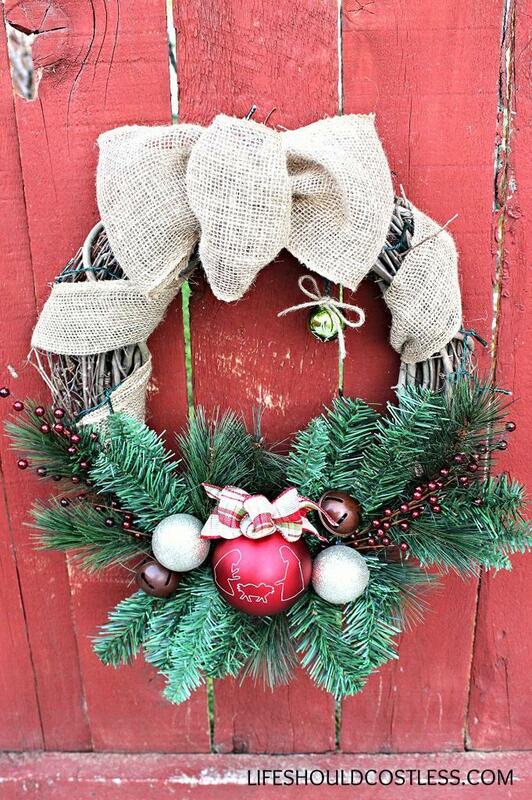 That inspiration is what gave this wreath the element that will set it apart from any other wreath! Since I can’t draw or freehand to save my life, I had my friend Hannah help me with the vinyl. 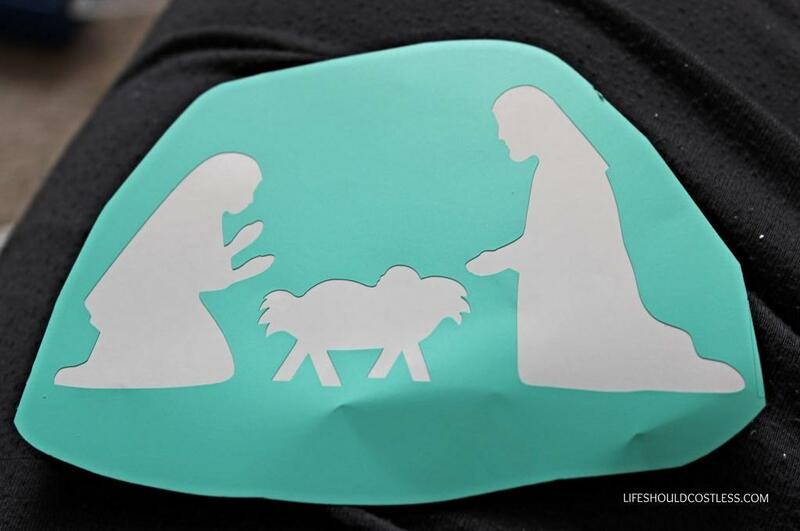 I sent her a couple of free Nativity silhouette patterns (similar ones found here and here) that I had come across online and she was able to get them down to just the right size that I needed for these over-sized ornaments (I found it easiest to attach the middle of the sticker first, baby Jesus, and then work my way outward). I had wanted to do the whole Nativity including the stable, but it really would only fit if the wreath were like 10X bigger…so I went with what would work and that was the most important part anyway. If you’d like to order these vinyl cut-outs directly from Hannah you can send her a message on her Facebook page found here. I found it easiest to cut the vinyl down to only slightly larger than I needed it. Otherwise it’s too hard to work with trying to stick it to something round. Using my new toy (A Dremel Micro, I got mine here ), I used the smallest drill bit that came in the kit and followed the edges and basically just outlined all the characters. I used the speed setting of 10 for most of it and 15 was the highest I dared go. Since I don’t think that plastic is very healthy, I made sure to work with a mask and protective eye-wear. Here is how it looks when the vinyl comes off. The second one looked even better since I was getting the hang of using the Dremel. Too bad I didn’t take a picture of the second one. 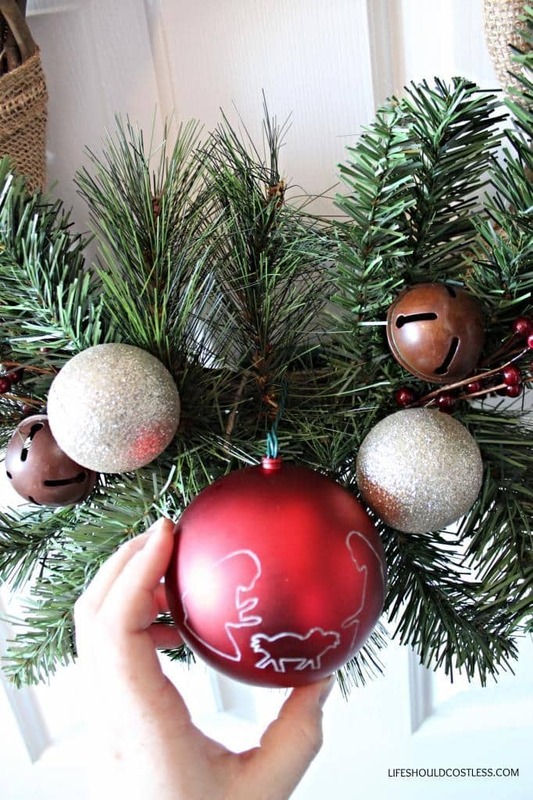 I looked everywhere for a beautiful star ornament to use to have hanging down (with a rice light inside), but I couldn’t find one so I ended up using the dremel for it as well. These ornaments were purchased at Wal-Mart in their miniature ornament section. Watch out though because some of the colors have black plastic on the inside and won’t work to shine the light through. For the additional ornaments, I went with some Chocolate Brown bells (Hobby Lobby) and I found these pretty champagne colored bulbs (Dollar Tree), I like them because they aren’t yellow gold and they aren’t silver…kind of a soft in between color. These bulbs do have a black center so they won’t work if you want to Dremel them. 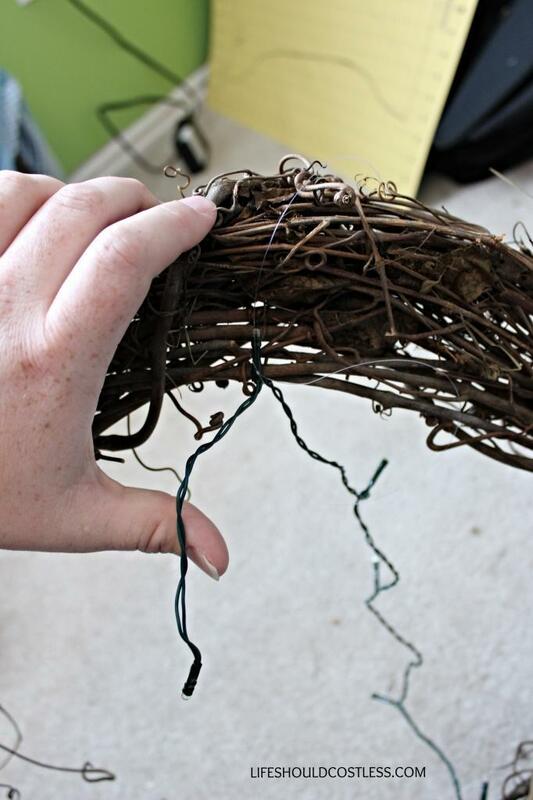 Anyway, I want the wreaths to be super secure so I first attached them with crafting wire and then when I was sure of exactly where I wanted them I hot glued them down. This was before I hot glued everything into place. 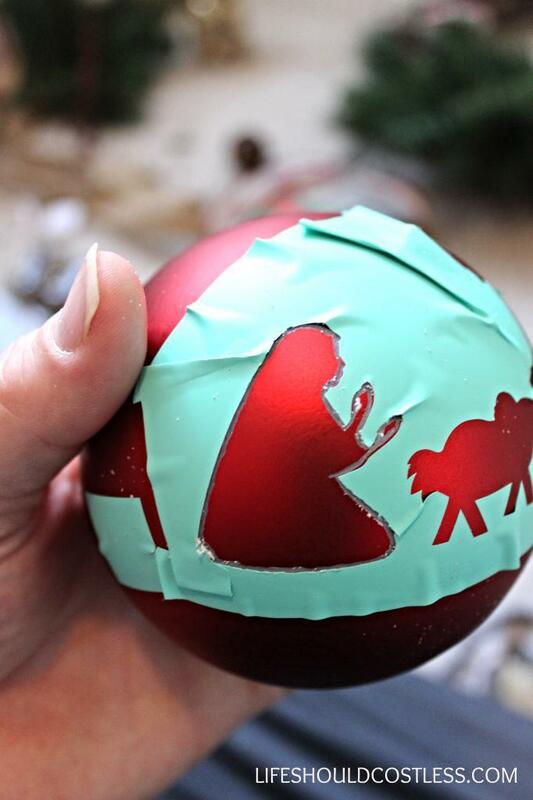 I also put a little where the rice light enters the red ornament to make it a little more secure as well. 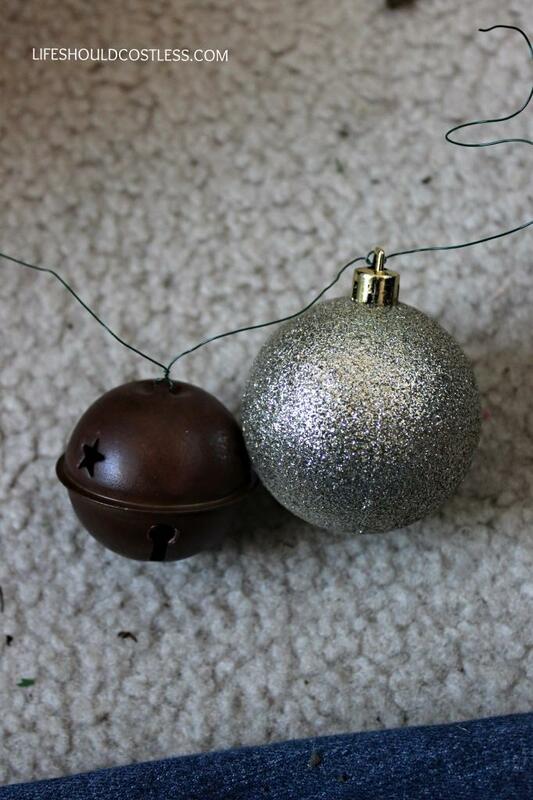 I started with the center ornament, hot glued it into place and then glued the outer ornaments too. 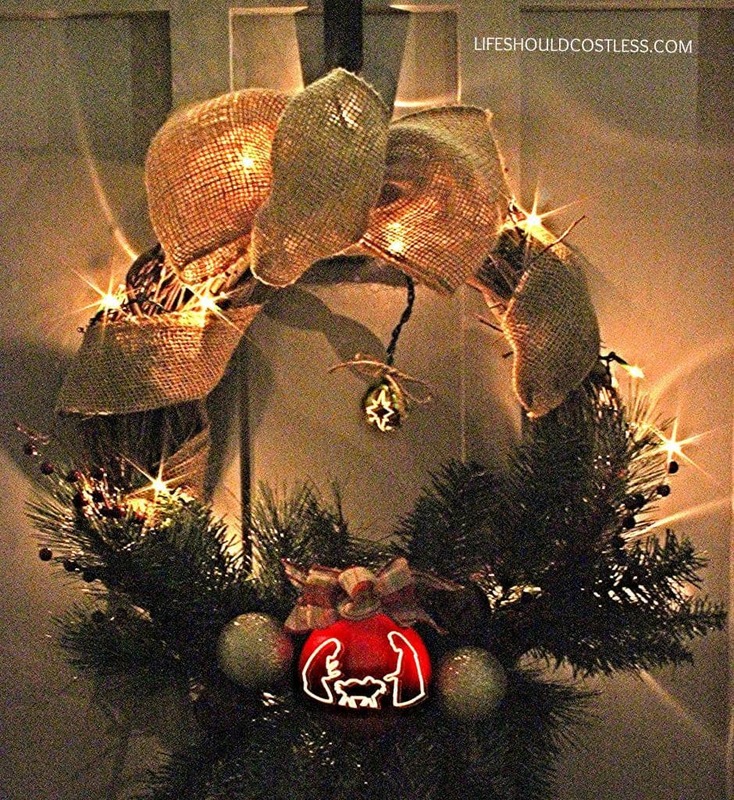 To hide the place where the rice light enters the red ornament I just used some craft wire and tied a little bow. It was then hot glued on. It’s coming together nicely though not quite done. 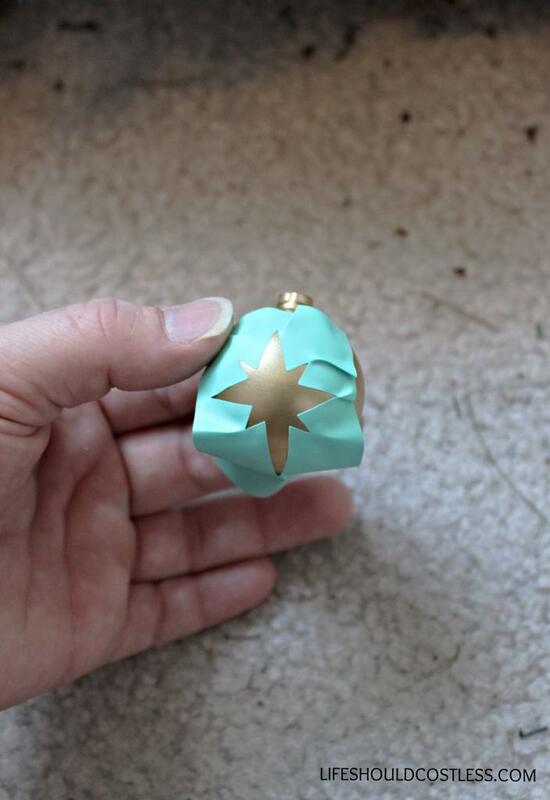 I don’t think I have a picture, but next I attached the star ornament with a little hot glue and then I tied a little bow with some twine to cover the place where the rice light enters the ornament. That finished it up. Next was a ridiculous amount of rushing to take pics while I still had daylight. The pics in the dark were easy to come by though…since the days are so short now. What it looks like at night. A BIG thanks to my Facebook friends that are photographers that gave me some tips to get the night pic. It’s not the best, but given my limited photography skills I think the shot did it a little justice. 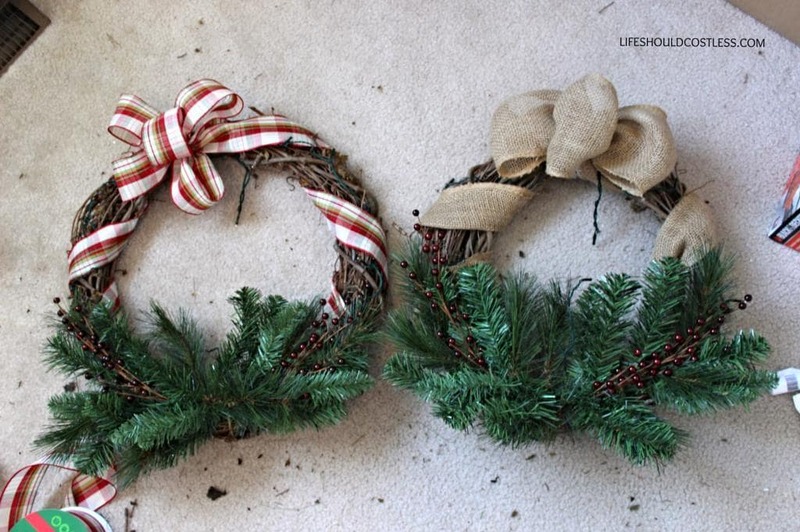 Oh, and since I wasn’t going to show you duplicates of the step by step on this freakishly long post, here is a shot of the other wreath. Suggested pinnable image, or the very first one will draw lots of re-pins too. Any photo can be pinned directly to Pinterest just by hovering over the photo with your house until the “P” appears and then you click on the “P”. 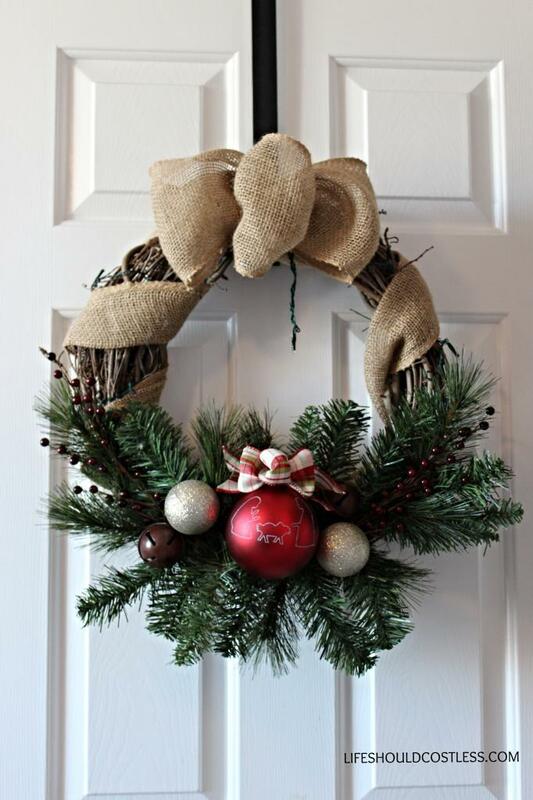 I think it’s safe to say that my wreath-making skills are improving. 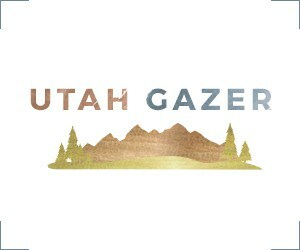 If you want to see any others I’ve posted about, go here. 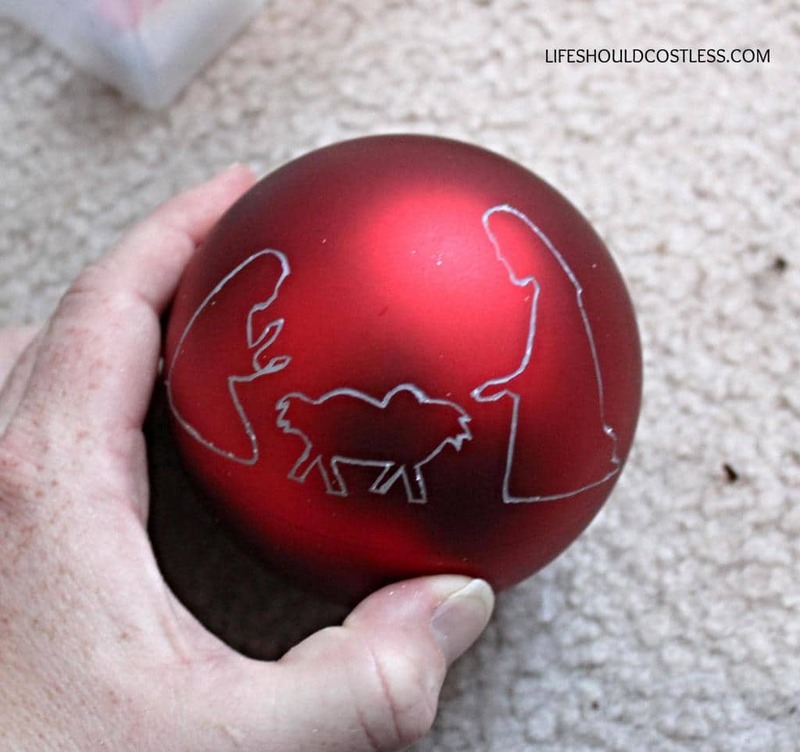 They turned out great and what a neat idea with the ornaments!